ASIS 2014, Atlanta, GA. – September 29, 2014 – DW®, the industry leader in digital recorders, surveillance cameras and related management software, announces the availability of our new Star-Light MPA megapixel analog cameras. Attendees will be able to experience the cameras at the ASIS International Seminars and Exhibits September 29 – October 2, 2014, Booth 3145. The Star-Light MPA cameras are groundbreaking intelligent, high analog resolution cameras, offering crisp and clear images with powerful surveillance and analytical features. Combined with our new low-cost high quality housings, the Star-Light MPA cameras are the perfect solution for any analog system that requires the highest analog resolution on the market. Star-Light MPA dome cameras come with CleanView™ technology. The new CleanView dome enclosures repel water and dust to maintain a camera’s image quality. The technologically-advanced hydrophilic coating alleviates spotting and smudges that can affect the performance of the camera. 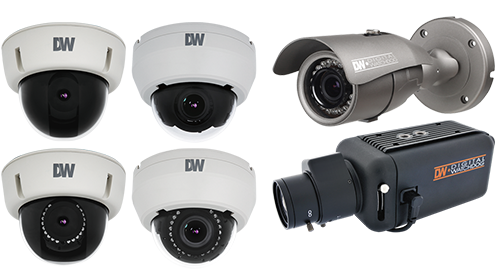 All DW® dome cameras will include CleanView within the coming year. The new Star-Light MPA cameras’ 1.3MP CMOS sensor is capable of capturing up to 720P megapixel resolution, allowing the camera to receive and process images in high resolution, digitally zoom into the Field of View (FoV) with no detail loss and display 800TV lines in color and 820TV Lines in B/W. The cameras also combine smart analytical features such as intelligent motion detection, automatic digital zoom and motion tracing. When motion is detected, the camera can zoom to the motion area, trace movement and predict the motion pattern. Combined with powerful image enhancement features such as Star-Light™ super low light technology in color and monochrome, true day /night with mechanical IR cut filters, 3D DNR, De-Fog™ enhancement for extreme weather conditions, remote camera control via RS-485/ UTC and alarm output, the Star-Light MPA is an intelligent and high resolution solution suitable for any application. The Star-Light MPA cameras with their clear image offer the best performance when they are bundled with DW®’s new VMAX960H Core™ DVR. The complete solution is ideal for any surveillance application where clear details are required in the image.